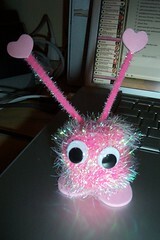 Bought this kit at Hobby Lobby for 70 cents and plan to make some more of these little guys because they amuse me. How cute is he? Pretty Darn! I remember when I was a kid…maybe right before high school (so, late 70s), we used to make little pom poms out of yarn and give them googley eyes. My friend Wendy and I also made families of octopi with googley eyes. So making this little kit had me feeling all throwback! I ran around hobby lobby looking for bags of eyes and glittery pom poms. I also got a pile of stickers, rubons and some cheapie decorative tapes for making valentines. I’m so excited!